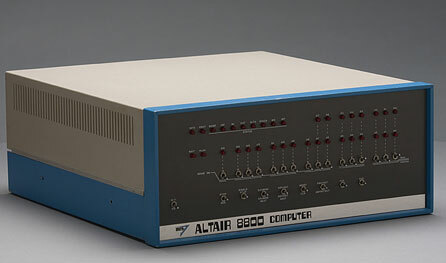 In contrast with the first microprocessor based personal computer—Micral, the MITS Altair 8800 was extremely successful market product. The designer—Ed Roberts intended to sell only a few hundred to hobbyists, but he was surprised when he sold thousands in the first month. The microcomputer was sold by mail order through advertisements in Popular Electronics, Radio-Electronics and other hobbyist magazines. Both kits and fully assembled machines were available. Today the Altair 8800 is widely recognized as the first spark, that led to the microcomputer revolution of the next few years, because the computer bus designed for the Altair was to become a de facto standard in the form of the S-100 bus, and the first programming language for the machine was Micro-Soft's founding product—Altair BASIC. In 1969 an engineer, working at the Air Force Weapons Laboratory at Kirtland Air Force Base in New Mexico—Henry Edward Roberts (born 1942), together with 3 other colleagues decided to use his electronics background to produce small kits for model rocket hobbyists. Therefore they founded Micro Instrumentation and Telemetry Systems (MITS) in Roberts' garage in Albuquerque, New Mexico, and started selling radio transmitters and instruments for model rockets. Rocket kits didn't achieve a market success, this later on MITS switched to calculator kits, which appeared to be more successful venture. The microcomputer industry really took off when Intel introduced the 8080 CPU in April of 1974. The 8080 processor was capable of addressing up to 64Kb of RAM and was powerful enough to build a real computer. Following the line of several improved models of calculator kits and test equipment, Roberts decided to design an Intel 8080 based computer, and in the first prototype was ready in October 1974. At the same time he was contacted by one of the editors of the magazine Popular Electronics, who knew MITS was working on an Intel 8080 based computer project and thought Roberts could provide the project for the always popular January issue. Thus the Altair 8800 (the name Altair was suggested by the editors, not by Roberts) was born (see the lower image). The Altair 8800 was launched at just the right time. There was already a sizable customer base who knew about computers and wanted to have one at hand—schools, colleges, electronics hobbyists, etc. Actually there were Intel 8008 based computer systems available in 1974, but they were not powerful enough to run a high level language like BASIC, suitable for non-professionals. The Altair had enough power to be actually useful, and was designed as an expandable system, that opened it up to all sorts of applications. Roberts optimistically told his banker that he could sell 800 computers and he knew they needed to sell 200 over the next year just to break even. For his surprise, when readers got the January issue of Popular Electronics, MITS was flooded with inquires and orders. They had to hire extra people just to answer the phones. In February MITS received 1000 orders for the Altair. The quoted delivery time was 60 days but it was months before they could meet that. Roberts focused on delivering the computer; all of the options would wait until they could keep pace with the orders. 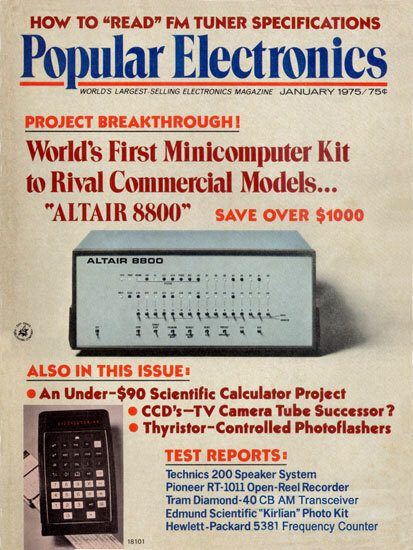 MITS claimed to have delivered 2500 Altair 8800s by the end of May. The number was over 5000 by August 1975. MITS had under 20 employees in January, but had grown to 90 by October 1975. The Altair 8800 computer (see the lower image) was very profitable and the expansion bus allowed MITS to sell additional memory and interface boards. Altair used a CPU Intel 8080A (rarely 8080), which worked at speed 2 MHz (each instruction takes 4 clock cycles). The RAM provided was only 256 bytes ("1024 word" memory) and you had to buy this memory board. The BASIC language, which was announced in July 1975, required one or two 4096 word memory boards and an interface board to be provided. Computer kit cost $439, 2 types of memory boards were provided—1024 word Memory Board ($176) and 4096 word Memory Board ($264). Later Roberts offered also a Parallel Interface Board ($92), 2 types Serial Interface Boards, Audio Cassette Interface Board and Teletype. Initially the programming the Altair was an extremely tedious process, as a keyboard wasn't provided. The user must toggle the switches to positions corresponding to an 8080 microprocessor instruction or opcode in binary, then to use the enter switch to load the code into the machine's memory, and then to repeat this step until all the opcodes of a presumably complete and correct program were in place (see the lower image of the front panel). Sounds weird, but when the machine was first shipped, the switches and lights were the only interface, and all one could do with the machine was make programs to make the lights blink. Nevertheless, many boxes were sold in this form. Roberts was already hard at work on additional cards, including a paper tape reader for storage, additional RAM cards, a RS-232 serial interface to connect to a proper teletype terminal, a video card, and a 8" floppy drive that used hard sectored floppies and stored 300 KB. The January 1975 article for Altair excited a Harvard University undergraduate named Bill Gates, and his good friend Paul Allen, and the duo contacted Roberts to write a BASIC language interpreter for the machine. Roberts show his interest, but... in fact Gates and Allen had no BASIC yet to offer. When they called Roberts to follow up on the letter he expressed his interest, the two started work on their BASIC interpreter, using a self-made simulator for the 8080 on a PDP-10 minicomputer. They figured they had only several weeks before someone else beat them to the punch, and once they had a version working on the simulator, Allen flew to MITS in Albuquerque to deliver the program, Altair BASIC (see the reference manual), on a paper tape. The first time it was run, it displayed Altair Basic, then crashed, but that was enough for them to join. The next day, they brought in a new paper tape and it ran (thank God:-). The first program ever typed in was "10 print 2+2" and after typing "run" it typed back the correct answer: "4". Allan was offered a position by Roberts as the Director of Software and the only member of the software department:-) Gates, who was then still a student, started working for MITS part-time after he left school. Later, Gates and Allen would leave MITS to begin a company called Micro-Soft. The January 1975 article would also inspire the creation of the Homebrew Computer Club by a group of Altair 8800 enthusiasts, and from this club emerged twenty-three computer companies, including Apple Computer. 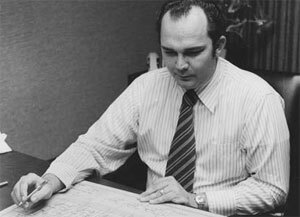 In 1977, MITS was bought by Pertec Computer Corp. for upwards of $6 million, and Roberts entered medical school at Mercer University. He worked as a country doctor in Cochran, Georgia, and died on 1st of April, 2010.